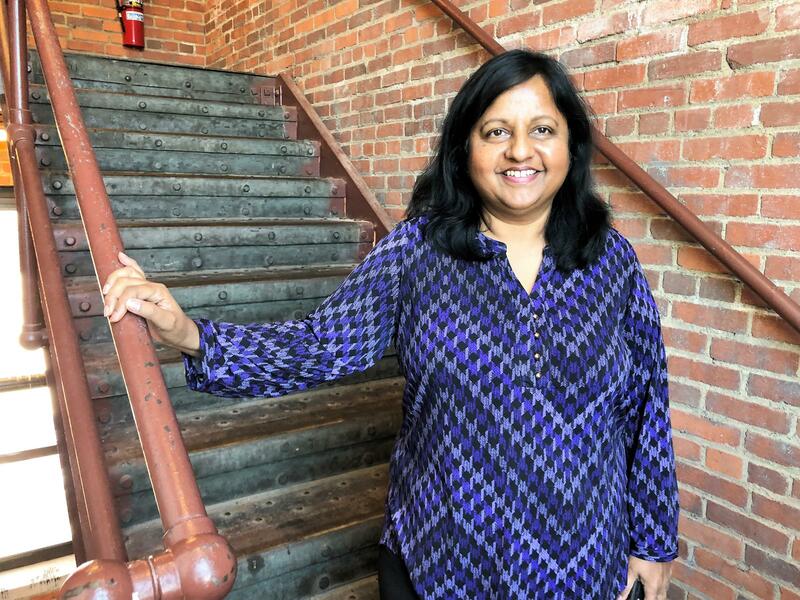 Radhika Reddy is the founder of the Ariel Center. Immigrants make up about four percent of Ohio’s population, but contribute more than five percent of the state’s taxes and start businesses more than twice as frequently as native citizens. This motivation comes from the need many immigrants feel to not only survive, but to thrive. Immigrants come to the U.S. with a hunger for success. Radhika Reddy always wanted more. The Cleveland businesswoman was never really satisfied with the life India had to offer. In 1989, Reddy came to the U.S. to get an MBA from Case Western Reserve University. Even though she graduated at the top of her class, she struggled finding a place that would hire her. Once she found a job -- $15,000 a year to work at a small company --it didn’t take her long to adjust. A month after she got her green card in ‘95, she started her own consulting business, later named Ariel Ventures LLC. Formally an electric factory building, the Ariel Center retains some of its industrial charm. In 2010, she and her newfound partners created the Ariel Center, a one-stop shop for international newcomers to develop businesses, find employment, and host cultural events. Now, she’s the founder of five different business ventures. Her story is not unique. Inna Kinney immigrated from the former Soviet Union with her family at the age of 11. After watching her father work hard at a low-paying job to support her family, she started her own business, the Economic Community Development Institute. It provides microloans for immigrants and others who need help. A 2018 Cleveland State University study found that while only 27 percent of native-born Americans in Ohio have a bachelor’s degree, 42 percent of foreign-born Ohioans have a four-year degree or higher. Former Cleveland City councilman Joe Cimperman is now the president of Global Cleveland, an organization that seeks to attract and welcome immigrants to the country. For him, it’s personal -- his mom was from Slovenia. Cimperman says having a rich immigrant community helps the region in other ways besides economics. Not only does the Cleveland State study show that immigrants go to college more than native-born citizens, they also divorce less and contribute more than their share in taxes. Though immigrants nationwide only make up 13 percent of the population, they contribute 15 percent of the country’s total economic input, 16 percent of the labor force, and 18 percent of all small businesses owners. Earlier this year, Gov. John Kasich established Ohio’s Office for Opportunities for New Americans. It’s designed to encourage business development among immigrants. Padmini Roy-Dixon, an Indian immigrant, is head of the program. She says it’s important that Ohio takes its immigrants seriously and provides them with help along the way. In a time where tensions surrounding immigration are heightened due to the current administration’s crackdown on immigration, the Office for Opportunities For New Americans sets itself apart as an ally. The Ariel Center’s Radhika Reddy says that welcoming people from other countries is crucial to the success of the American economy. It’s a community that fought to get here -- and they want to make it count.